Mission: Tomorrow » The Space Review: Asteroid mining boom or bubble? The Space Review: Asteroid mining boom or bubble? Asteroid mining boom or bubble? Some space concepts that once seemed like science fiction are starting to become reality. Take, for example, space tourism: the idea of private individuals, rather than professional astronauts, paying their way for a flight to space was a staple of many science fiction tales. Today, seven people have paid for flights to the International Space Station (one even flew twice) and hundreds more have bought tickets or put down deposits for suborbital space tourism vehicles that will start flying within the next couple of years. Reality has worked out a little differently than fiction—no one today is flying Pan Am at all, let alone on a shuttle to a wheeled space station—but it’s an idea no longer relegated to paperbacks and B-movies. If space tourism seemed at least a little like science fiction, then the idea of asteroid mining seems a lot like it. The idea of individuals, corporate conglomerates, and governments sparring with one another as they seek to harvest the material wealth of asteroids offers writers a rich vein, so to speak, of drama that draws parallels to terrestrial mining rushes in history. Many space advocates have also long hyped the potential wealth in asteroids, from precious metals to volatiles, which could reshape the economics of spaceflight and even terrestrial industries. But the idea of lassoing even a small near Earth object (NEO) and extracting materials from it seemed like, well, science fiction, given the current state of space capabilities. Some companies, though, are challenging that perception. Last April, Planetary Resources announced its plans to develop a series of spacecraft to prospect and, eventually, extract volatiles and other materials from NEO, perhaps within a decade (see “Planetary Resources believes asteroid mining has come of age”, The Space Review, April 30, 2012.) Last week, a second startup announced its plans to enter this market on potentially an even more aggressive timescale. However, are we seeing the beginning of a new industry sustainable over the long term, or is this, like some previous commercial space efforts, a bubble that will soon pop, taking with it some or all the companies involved? 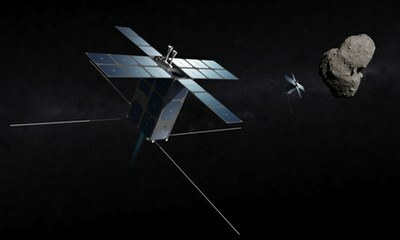 The new asteroid mining venture, Deep Space Industries (DSI), unveiled their plans at a press conference Tuesday in Santa Monica, California. The company features a number of familiar faces for those who have followed space entrepreneurial and advocacy efforts over the years. Rick Tumlinson, co-founder of the Space Frontier Foundation and one of the key people involved with MirCorp’s ill-fated effort to commercialize the Mir space station, is DSI’s chairman of the board. The CEO is David Gump, who most recently was president of Astrobotic Technology, one of the leading competitors in the Google Lunar X PRIZE competition. John Mankins, a former NASA official who has been a leading advocate for space-based solar power, is the company’s CTO. Read more: The Space Review: Asteroid mining boom or bubble?.